Not too cold, not too hot—the conditions for life are found not just on Earth, but on a handful of other places out in the universe. We Earthlings are a really lucky bunch. Our planet is located in just the right spot in our Solar System. We’re not too close to the Sun, like Mercury or Venus, where the average temperature can reach more than 400°C. It’s not too far away, either, like Jupiter or Saturn, where it can get really cold—way under 140°C. But our planet is not the only one with such ideal conditions. A bunch of other planets and moons are also found in the so-called habitable zone or Goldilocks zone. Planets or moons located in the Goldilocks zone are at the right distance from their star so that they’re not too hot and not too cold—just like Baby Bear’s porridge in the fairy tale. Their overall temperature is just right for the formation of liquid water, a landmark of life. Of course, it is not just about being “in the zone”. Mars, for example, is found within the habitable zone of our system, and we have yet to find the first Martians. Also, being in the habitable zone doesn’t mean they actually have water, but they could. These potentially habitable planets need to meet other requirements to be able to host some sort of life, like having an atmosphere, being a rocky planet (and not one made up of gas) and having the right mix of chemical compounds needed by living organisms. This question has been in the mind of people for aeons, and maybe now we are finally close to getting an answer. Several celestial bodies, either planets or their moons, have been identified as potential candidates to host life. Some are planets around the same size of Earth, orbiting a star much like our own Sun. Others are called super-Earth planets and are as large as 45 times the size of Earth. In the search for life on other planets, the most famous candidate, arguably, is Mars, which made some big news recently when it was confirmed it hosts a vast amount of water just beneath its surface. The finding, according to experts, means that Mars could one day allow for the establishment of a human colony and perhaps even allow some other lifeforms to exist. “Certainly on Earth, we find life associated with big ice sheets. So it doesn’t actually have to be liquid water in which life can exist, and it would be very interesting to look at where these ice scarps are melting,” Simon George, at Macquarie University, said. “[The melting ice could] potentially expose new bits of ice and possibly be a very interesting place to look for new evidence of life, either in the recent geological past or even living today on Mars,” George added in a recent news report. Beyond Mars, another place where scientists are pouring their hopes are the moons from a big planet. Saturn, one of the largest planets of our solar system, has 62 moons, some of which are tiny moonlets just 1km in diameter. Others are larger than some planets, like the moon Titan, nearly half the size of Earth. One of Saturn’s moons has been the focus of attention among extraterrestrial life hunters: Enceladus. Here, scientists have discovered vast oceans of water, buried 30 to 40 kilometres beneath the moon’s surface, which is covered in ice and snow and where temperatures reach -198°C, at noon! 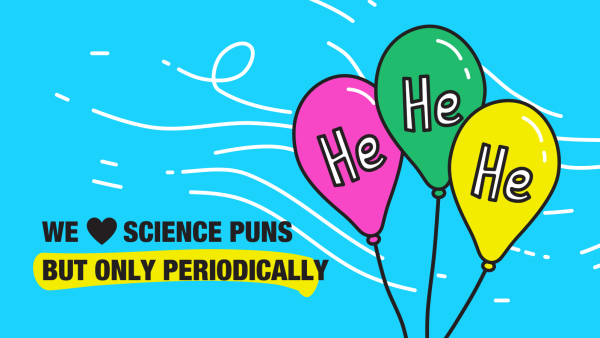 The Cassini space probe revealed the existence of all the vital ingredients for life in these oceans: carbon, nitrogen and hydrogen. “I think this is it. From an astrobiology point of view, this is the most interesting story,” said Chris McKay, a planetary scientist at NASA in a recent news report. Saturn is not the only planet with a moon that potentially hosts life. 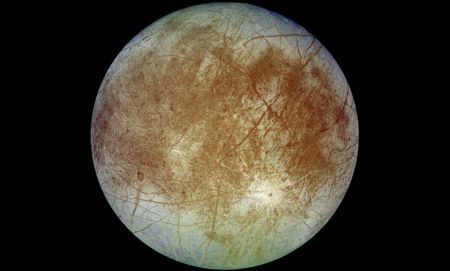 Jupiter’s moon Europa has been a target for exploration since the 1960s. Made famous by the book (and movie) 2001: A Space Odyssey, Europa has an ocean of liquid water lurking beneath a layer of ice 15 to 20 kilometres deep. At least two future NASA projects plan to explore this moon in more detail. Europa Clipper and Juice, both planned to launch some time in 2020, will make detailed studies of the surface of Jupiter and three of its moons, Ganymede, Callisto and Europa. Other stellar systems that host potentially habitable planets have been identified in the past years. 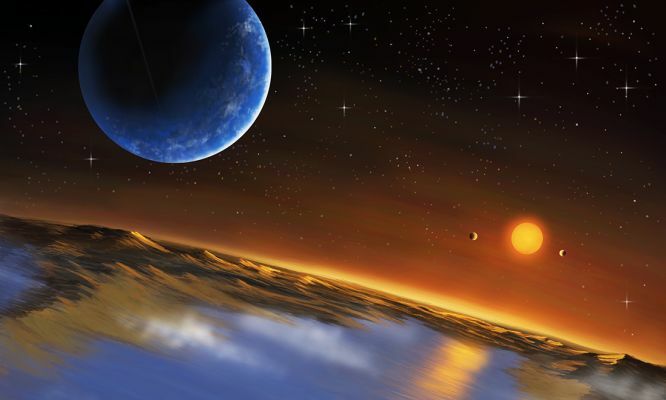 Just last year, a study reported the existence of a possible super-Earth planet, about 41 light years away from Earth. The planet, named LHS 1140b, is 1.4 times the size of Earth and twice as dense and is found within the habitable zone of its star system. 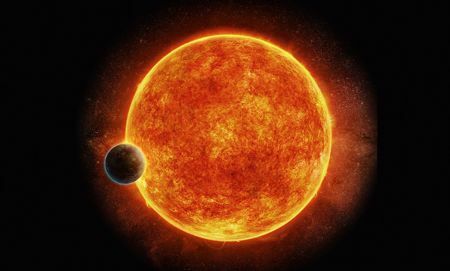 “This is the most exciting exoplanet I’ve seen in the past decade,” said lead author Jason Dittmann of the Harvard-Smithsonian Center for Astrophysics in a press release. However, nothing yet is known about the inner components of this planet. “Right now, we’re just making educated guesses about the content of this planet’s atmosphere,” said Jason. The planet 1140b was discovered through the MEarth project, which seeks to identify Earth-like planets. Besides 1140b, the MEarth project has so far discovered two other Earth-like planets, GJ1132b, and GJ1214b. Another stellar system that has revealed the existence of potentially habitable planets is called TRAPPIST-1. The system, 39 light years from our planet, is located in the constellation Aquarius, and recent observations have revealed the existence of at least seven small planets orbiting the central star of this system. Out of these seven, three planets are found in the habitable zone. “This is an amazing planetary system, not only because we have found so many planets, but because they are all surprisingly similar in size to the Earth!” said Michaël Gillon, at the University of Liège in Belgium, who led the 2016 study, in a press release. Two of these planets, TRAPPIST-1b and TRAPPIST-1c, were further studied and are likely to be rocky planets, like Earth, which makes them even better candidates for hosting life. 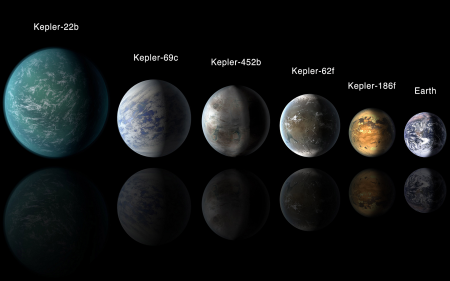 Other potentially habitable planets have been identified by NASA’s Kepler space telescope. One of these planets, Kepler-452b, is located in the constellation Cygnus, with a star very similar to our own sun. The planet is about 60% larger than Earth, but whether it is a rocky planet or if it contains liquid water is still a mystery. 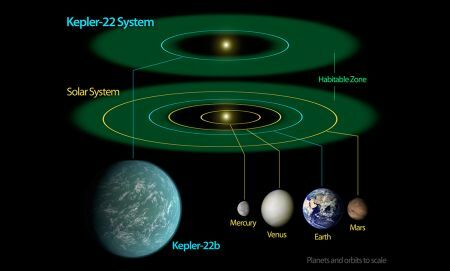 “We can think of Kepler-452b as an older, bigger cousin to Earth, providing an opportunity to understand and reflect upon Earth’s evolving environment,” said Jon Jenkins, from NASA’s Ames Research Center, in an official press release. “It’s awe-inspiring to consider that this planet has spent 6 billion years in the habitable zone of its star; longer than Earth. That’s substantial opportunity for life to arise, should all the necessary ingredients and conditions for life exist on this planet,” he added. But how do you really know if a planet can host some sort of life? Until you actually find some alien life form, it is all really theoretical. But now, a new study just published found solid evidence that one species of microorganism could survive in Saturn’s moon Enceladus. The compounds found in Enceladus, such as methane, carbon dioxide, ammonia and hydrogen, can be either produced or used for growth by microorganisms. In this new study, researchers managed to grow microorganisms under the gas and pressure conditions thought to be present in Enceladus. Researchers found one survivor: a microorganism capable, in theory, of surviving in Enceladus, even under the presence of nasty compounds that would inhibit the growth of other life. “The microorganism Methanothermococcus okinawensis thrives and produces methane under conditions similar to those found in Saturn’s icy moon Enceladus,” says Simon Rittmann, at the University of Vienna, who led the new study. Furthermore, researchers identified a geological process known as serpentinisation, which might produce enough hydrogen for the survival of some kind of lifeform on Enceladus. 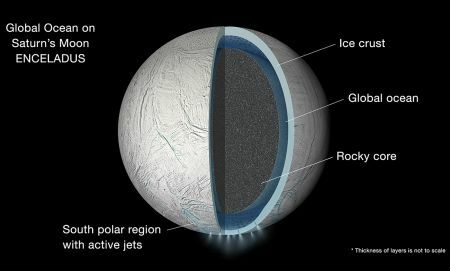 The findings support the idea that certain microorganisms can thrive in Enceladus and be responsible for some of the methane detected in this moon. But will we ever find some sort of intelligent life? Some scientists think so, and the reason is simple: odds are on our side, sort of. It is a big, big universe with trillions of planets and stars, and we already know many moons and planets very like Earth have the right conditions for life as we know it. So why not? “In the search for life in the Solar System and beyond, the physiological capabilities of several organisms found on Earth that live or survive under extreme environmental conditions make it likely that, somewhere in the universe, alien life could exist . It could be possible that we might find life just a doorstep away,” says Simon. In the margins: why does the date for Easter change every year? 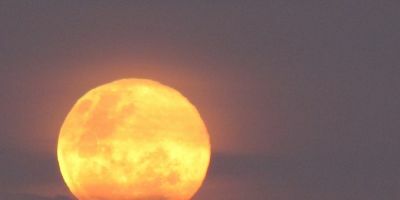 The SETI Institute has analysed images of our Moon and pinpointed a possible home away from Earth. Keeping an eye on your health is extra important if you’re 54 million kilometres from a hospital. 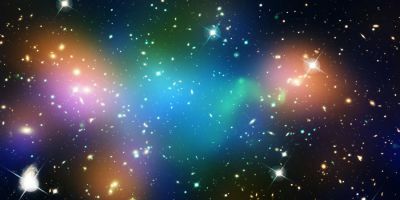 Buckle up and pack your popcorn: we’re in for some intergalactic fireworks, only not quite like we were expecting.